New Camera!!! And another custom order! I was able to obtain a new camera for the nursery and personal use. I am now the proud owner of a Nikon D3200! This pic of my newest custom order, Gemma, was taken with my new camera. 2/17/2014 Enzo is back in the mix! He's been textured and received his stunning newborn grey eyes! We are only awaiting rooting at this point. This little 17" beauty is on her way home to her new mommy, but I just wanted to share her with you real quick. You can see move of her pics in her album in the reborn galleries. She is the reason Enzo took a back seat in production. 1/30/2014 Fern Kit is now called Enzo and he's got paint! This is the Fern kit by Morgan & Perez. In a week or three it'll be a lifelike preemie sized baby. 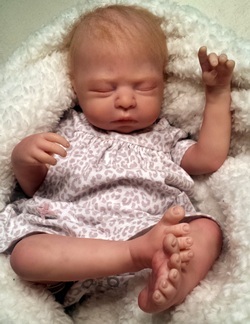 Irelyn Rose is 18" long (Leah kit by Sandra White). 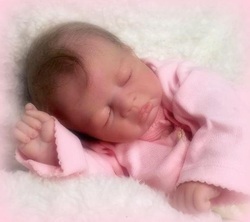 She is painted with GHSP and rooted with soft strawberry blonde Tibetan Mohair. 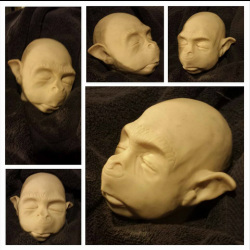 Update (12/16/2013): Now named Ragner, the dragon hybrid infant's head sculpt is complete and I do plan on sculpting Ragner a twin sister after I'm finished with him. Her name will be Rafrata. Look in the galleries for updated pics of Ragner. So I think I've got a lovely idea that I wanted to share. 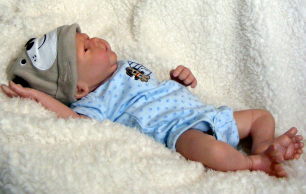 I believe I'll be adding two other babies to my sculpt list. A tiny Were-Panther newborn. And a little Dragon Hybrid newborn. Both will have sculpted heads and limbs, and doe suede bodies. The were-panther will be around 17-18" in length -when finished and the dragon hybrid will be around 17-18". The were-panther will be exactly that a were-panther, a child born with both human and panther traits. The dragon hybrid will be similar in vision to the were-panther but with the child being a combination of dragon and human traits. They will be highly unique. Hopefully we'll see another werewolf hybrid baby soon enough. Hey friends. I'm just getting started on another large baby. She'll be approx. 16" long when finished, have a sculpted head with green eyes, vinyl limbs, and a soft body. She'll be a preemie and fit into most preemie clothing. 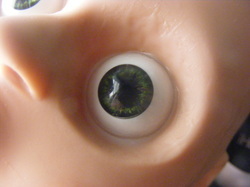 I've set the beautiful green eyes into the head armature I'm using and will begin laying the layers of "skin" clay over the armature in preparation to sculpt. I'll be sure to take a picture of her every step of the way and post pics of the limbs and head prior to painting and adding hair. 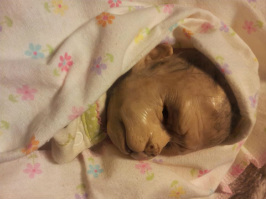 So I've started working on a realistic mini-baby. I started with a foil head armature and added some bulk and starter features with clay. 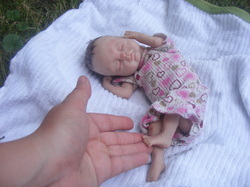 Then added a layer of "skin" and sculpted in micro preemie details (around 28wks). I sculpted two tiny legs and two tiny arms (well two left arms, as I didn't like the first).